I had no idea what I was going to write about today. There was nothing happening of any interest. The snow, although it is melting very very slowly, is still there. The birds and animals are still very sluggish. My husband is still chipping away on the three inches of ice that formed on our sidewalk when we were away from home for a few days. Then something happened that annoyed me to no end and that is my topic for the day. On Easter Sunday, March 31, my youngest grandson will be three years old. My daughter has forbid me to get him any toys or clothes. He is the youngest and he has the toys and clothes from all the previous grandchildren. I thought about it and decided to get him a US Savings Bond. At least it would be something to give him and as long as the country doesn't go to pot, it would be worth something someday. I managed to find his Social Security number and gathered his full name and any other information I thought would be needed. I then got into the car and drove to the bank. I waited in line because it was rush hour at the Princeton bank. 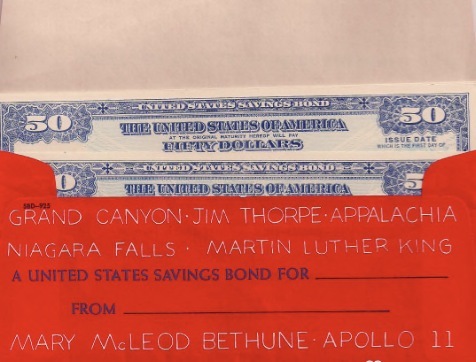 When I got up to the teller, I asked to buy a savings bond. She looked at me and said "banks don't sell savings bonds any longer". She said you have to go online to buy them. I asked how long it would take to receive it because I needed it by Sunday. She said, "Oh, you don't actually get a bond anymore". I said that there are probably many old grandmothers who can't use the internet, but would like to buy savings bond. All she said was "I know". So here I sit trying to decide what to do. Do I go online and buy a bond? Do I deposit some money in a savings account I have for him? Do I give him cash? Or do I just ignore what his mom says and go get a perfectly useless toy? Then I realized there are many children who don't have enough clothes let alone toys. I realize that there are many grandparents who can't buy their grandchild a gift. I guess I have no reason to be annoyed but just very grateful.